Dental Implants don't have to cost you a fortune. We understand cost is always an issue when it comes to affording dental treatment so we at Frederick Dental Group are offering a more affordable option. We also have convenient payment plans through Care Credit. Just ask one of our Dental Team member and they can provide you more details. Give us a call at 301-624-1001 to find out more. Dental implants Frederick Maryland provides a permanent solution for compromised teeth. Rather than cover your mouth to hide missing or failing teeth, you will smile wide and laugh with confidence as you go through your day. After you complete the process of bringing your mouth to near natural condition through implant restoration, you will enjoy eating a greater variety of foods, whether dining in public or in the privacy of your home. No longer does the gap from extracted teeth determine which foods you can take pleasure in. Dental implants in Frederick MD, offers a stable platform for all of these activities during your day, and is a very common corrective jaw surgery. We offer two types of dental implants at the Frederick Dental Group standard dental implants and mini implants. After the implant has healed it is time to place an abutment on the implant. The abutment serves as the base for your new tooth. One this is placed an impression of the abutment is taken and is used to create your permanent restoration. Some offices have an onsite lab to create the crown, but others will have to send it to an outside lab. Once the restoration is completed you can return to the office to attach the restoration permanently. Your smile will look just like it used to, and after a short period of getting used to the implant it will feel just like one of your own teeth. For more information on the procedure click here. Frederick Dental implants are the answer for individuals who are tired of their partial that does not offer the strength of an implant, not to mention the dependence it has on surrounding teeth. Many people are now choosing an implant over dentures. The other alternative, a bridge, also involves adjacent teeth that are compromised during this process. A bridge must be attached to them for security, and this requires altering their surface areas. The dental implant (endosseous implant or fixture) process is a two-part procedure. The first phase involves a surgical course of action during which the implant is established by placing a specialized screw into the jawbone. To introduce the screw to the jawbone, a small incision is made in the gum. After the implant is placed, the gum is sutured. 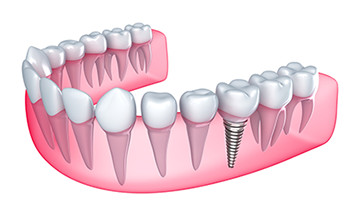 The specialized screw is then given time, three to six months, to bond with the jaw. This bonding process is known as osseointegration. For those in need of multiple implants, the implant process can be completed in one sitting if necessary. During the three to six months healing time, temporary crowns can be installed so that you can eat and speak with confidence. These temporary crowns also allow you to laugh and smile with ease since your teeth look natural. Once the osseointegration is completed, you will find yourself looking forward to your next visit to Frederick Dental Group to have the implant process finalized. The second phase of the implant procedure is to establish an abutment on the implant. This abutment serves as the base for your new tooth. It is a custom-made post that is attached to the top of the implant screw. After the abutment is placed, an impression is taken. This impression is used to create your permanent restoration. Some dental offices have an on-site lab where the crown is created. Other offices employ an outside dental lab to construct the crown. Once the restoration tooth is completed, you return to the Frederick Dental Group office to have it permanently attached. Your implant restoration is complete. There is a very short adjustment period to your new teeth … teeth that will give you decades of enjoyment. You will brush, floss, and regularly rinse just as you do with your natural teeth. You will sleep more comfortably and most likely have fewer headaches. Perhaps most importantly, you will smile, laugh, converse, and eat with natural ease in no time at all so that daily interactions are more enjoyable. Call and make an appointment to have a thorough discussion with the Frederick Dental Group about the benefits dental implants might offer you. With over 22 years of dental experience, we are dedicated to providing the very best, well-rounded dental services to residents of Frederick, New Market, Mount Airy, and Urbana. We offer a 5-year warranty on our work if a patient returns during the recommended preventative-maintenance schedule.